We finished the deer fence! It finally feels like we have a garden. 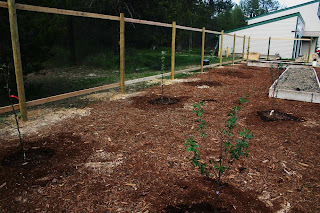 Completing this part of the project allowed us to finally plant out our fruit trees, currants, honeyberries and raspberries. We will be planting out more over the rest of the weekend, but I had to post an update on the massive garden project. Jeff is putting the finishing touches on the fence. 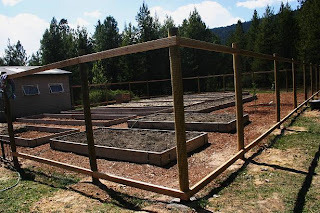 We used 4" x 10 foot posts buried 2 1/2' and deer netting for now. Next year or the one after we'll upgrade to wire. 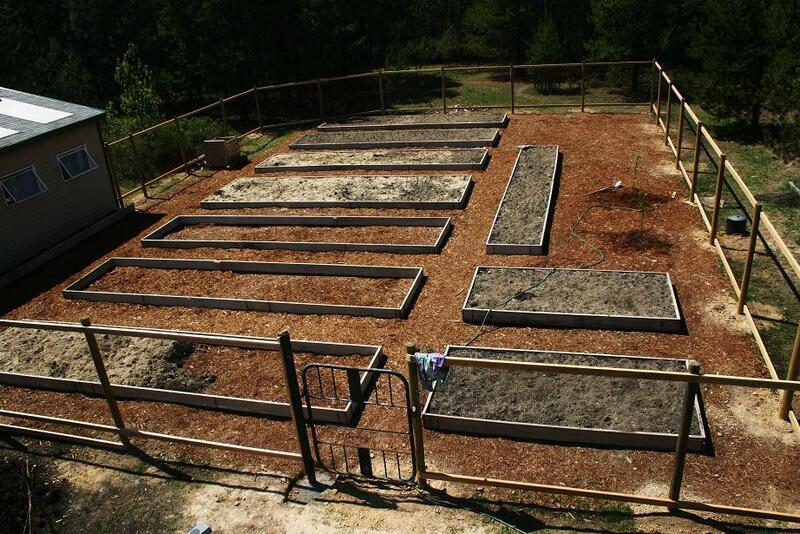 We still have some soil to move and some beds to fill. We wanted to get the fence up first as we had fruit trees and berry bushes to plant. We're still 2 weeks ahead of our last frost date, June 1. The fence looks gorgeous! Jeff did an awesome job. It will look even better when grass is growing all around the edges and there is a nice fresh layer of mulch. An aerial shot of the garden. We've got one wonky corner in the back left. 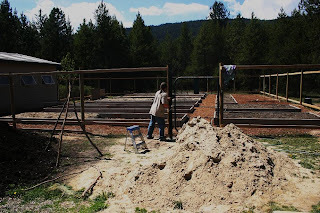 We were constructing our garden and pretty far along in the process when a neighbor came by and let us know where our property boundaries were. Turned out the guy who sold us the property had it wrong. Oh well, it worked out. Our attempt at the American Gothic pose with our Italian plum tree. This was the first living thing we planted in our garden! 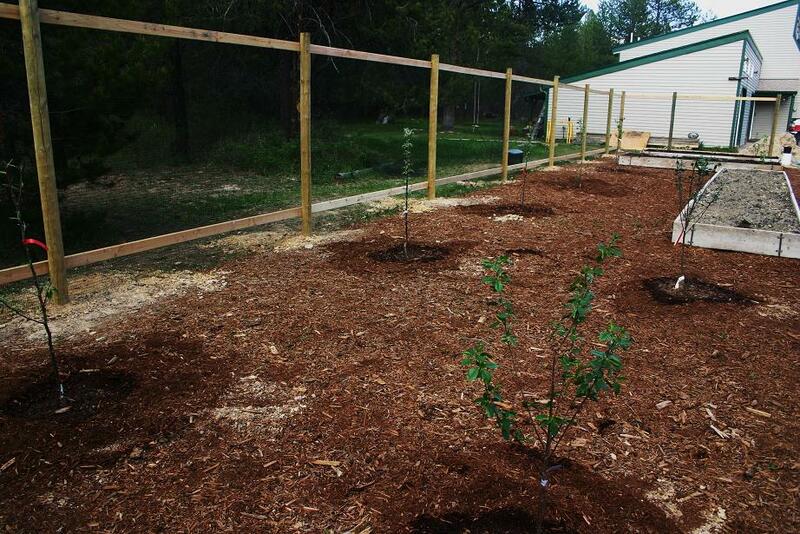 It's hard to see, but all of our fruit trees are in. 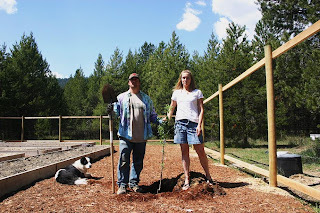 We have 2 dwarf northstar cherry trees, 2 pear trees, 2 apple trees and one Italian plum tree. Behind that, we have 2 honeyberry bushes, 1 black currant, 5 heritage raspberries, and 5 fall gold raspberries.